A popular T-shirt in Vienna declares “There are No Kangaroos in Austria!” The apparent confusion regarding the difference between Austria and Australia brings sighs of exasperation amongst many Americans living in Vienna who have had their U.S. mail arrive after a detour to Down Under. But while Vienna has always been right where it is, its place in European politics and culture has shifted often throughout its 2,000 year history. Today, Vienna is once again in the center of Europe. But not so long ago, Vienna was just barely on the western side of the Iron Curtain. Many visitors are surprised to learn that Vienna is actually further east than Prague and Berlin. Vienna was once the heart of a vast realm, the Habsburg Empire. For a time, the possessions of the Habsburgs, who ruled for more than 600 years, were so far-flung that it was said that the sun never set on its dominions. All that came to an end more than 80 years ago. Today, Austria is a small country of about eight million people. But Vienna still has heart. It is one of the most comfortable, interesting, beautiful capital cities in the world. Vienna is first mentioned in the first century under its Roman-Celtic name Vindobona. It was established by the Romans to be a frontier fortress to maintain vigil over the Danube which served as the northern border of the Roman Empire. By 488 A.D., however, the barbarians succeeded in pushing the Romans back and for a few hundred years all trace of civilization here disappears. Today, only some ancient stones from the Roman fort survive from those dark centuries to provide some archaeological record of Vienna’s beginnings, but its location on the Danube made it important early on as the crossroads for much of the trade traveling north and south, and east and west. Charlemagne reinstated Vienna as a border post, then the Babenberg dukes eventually won control. When their dynasty died out, the Habsburgs became first dukes of Austria and later Emperors of the Holy Roman Empire which comprised much of Europe. But while the power of other ruling families in Europe was often gained by the sword, the Habsburgs were more inclined to obtain their lands and power via marriage and diplomacy. Perhaps that explains the wealth of Vienna’s music, art, and architecture as well as its other pleasures that continue to delight Vienna’s citizens and visitors today. 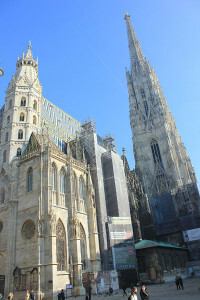 Rising from Vienna’s old city center, just beyond where the stone walls of the Roman camp once stood, the predominantly Gothic Stephansdom (St. Stephan’s Cathedral) continues to tower over the hearts and minds of the Viennese as it has for some 800 years. Known affectionately as Der alte Steffl (Old Steve) by the Viennese, it blends the styles of many ages into a unique and harmonious whole. Its colorful tiled roof depicts the two-headed Habsburg eagle bearing the imperial crown and the order of the Golden Fleece. Radiating away from the Stephansdom are a number of little streets as intricately connected as the threads of a spider’s web. And within the web, more churches, museums, palaces, boutiques, galleries, antique shops, coffeehouses, sidewalk cafes, and restaurants await the visitor. It doesn’t really matter which direction you choose to walk when wandering about. The old Inner City holds endless delights. Encircling the Inner City is a broad boulevard called the Ring. It replaced the city fortifications that were torn down in the mid-19th century by order of Franz Joseph I, the Habsburg emperor who ruled from 1848 to 1916. Amongst the treasures lining the Ring is the State Opera House. For many Viennese, the soul of Vienna resides within its elegant interior. The opera in Vienna is reasonably egalitarian. There’s a ticket price to fit everyone’s pocket because the Viennese love of music is not class-bound. What matters to the Viennese is the quality of the performance. There are innumerable museums in Vienna. But the greatest of them all is the Kunsthistorische Museum located further down the Ring. Its massive collections include a wealth of art by Rembrandt, Raphael, Bosch, Titian, Rubens, and Vermeer, as well as the largest collection of Brueghel in all the world. And competing with the richness of its art, the intricately designed marble halls of the museum are quite breathtaking. Facing the Kunsthistorische Museum is the Natural History Museum chock-full of curiosities. Its collections were started by Maria Theresia’s husband, Franz Stephan von Lothringen, and enlarged by their successors. Dinosaur skeletons, stuffed mammals, birds, and fish, minerals, one of the oldest prehistoric sculptures in the world, the Venus of Willendorf, and unique painted skulls from Hallstatt graves, treasures all. Between the two museums is the commanding memorial to the 18th century Habsburg ruler Maria Theresia who sits high on her throne surrounded by her ministers and generals. In addition to being the only female ruler (and one of the most successful) in the history of the House of Habsburg, Maria Theresia bore 16 children. Across the street, the spacious grounds of Heldenplatz lead to the Hofburg, formerly the imperial palace. Today, this magnificent open space reveals many of the splendid public buildings and gardens lining the Ring and contributes to the overall beauty of this boulevard, enhanced in spring by its many flowering lilac bushes. The mixture of styles along the Ring blends into a surprisingly harmonious study of European architectural history, ranging from the neo-Grecian style Parliament to the neo-Gothic Rathaus (city hall), the neo-Renaissance Burg Theater to the neo-Baroque Imperial Palace, enhanced by the elegance of the formal gardens of the Burggarten and the Volksgarten. The Hofburg, just inside the Inner Ring, was started in 1279 and eventually became the imperial residence of the Habsburgs. Franz Joseph I, a resident for 86 years, slept on a spartan iron bedstead in his luxuriously appointed apartment as did his wife, the very elegant and beautiful Empress Elizabeth, affectionately known as Sissi by the Viennese, in hers. Franz Joseph ruled for 68 years. Accompanying his spartan tastes in comfort was an equally spartan attitude towards food. The etiquette of the day dictated that courses end once the emperor had finished eating. At large banquets, many guests had hardly been served their first course by the time Franz Joseph had finished his last. A tradition arose for guests to retire to the nearby Hotel Sacher for dinner, after dinner. The Hotel Sacher still serves the world famous Sacher torte (a chocolate cake layered with apricot jam) created there. Sissi herself was quite ahead of her time in staying fit. Each morning at 5 a.m. she bathed in cold water in a copper bathtub. She was an excellent horsewoman and designed and followed her own personal fitness training regime which included gymnastics on a wooden ladder and rings which are on display in her former rooms. She retained her remarkably small waist throughout her life which was ended by an assassin’s file. The Hofburg, also houses the Schatzkammer (Imperial Treasury) containing an abundance of treasures from the past. The thousand year old bejeweled crown of the Holy Roman Empire is on display here as well as other imperial insignia. But what’s truly astonishing are the relics on display in the Ecclesiastical Treasury. Amongst its treasures is the Holy Lance which is reputed to have pierced the side of the Lord and thus bathed in His blood. There are several thorns from Christ’s Crown of Thorns, particles of the True Cross, one of which has a nail hole thought to have soaked up His Blood, hairs from his beard, droplets of His blood, a piece of his shroud, and the nail that pinned Christ’s right hand to the Cross. St. Stephan’s purse is said to have contained his blood, another reliquary contains one of St. Peter’s molars, another a fragment of the Virgin Mary’s veil. All together, the Schatzkammer is one of the finest treasuries in Europe. Next to the Treasury is the Burgkapelle (the Imperial Chapel) where the Vienna Boys Choir sings during Sunday morning mass. The origins of the Vienna Boys Choir go back to the 15th century. Today, 150 boys receive music training and general instruction in the Augarten Palace. The boys form several choirs and perform all over the world. The famous Spanish Riding School, founded in the 16th century, is housed in the former imperial stables attached to the Hofburg complex. Archduke Charles brought the Arabian horses from Spain to Lipizza near Trieste, then a Habsburg possession. The horses are dark grey or almost black at birth but turn white by the time they are about five years old. They are trained in classical equestrian arts cultivated over four centuries. Each carefully controlled maneuver once assisted the rider in combat. Loss of control could mean death in battle for the rider, defeat instead of victory for an army. At the end of WWII, General Patton, commander-in-chief of the U.S. occupying forces and a fine horseman who had participated in the first Olympic equestrian competition in Stockholm in 1912, placed the horses of the Spanish Riding School under his protection, thus ensuring their survival during the early post-war years. Following the restoration of the Hofburg’s elegant glass greenhouses, an indoor/outdoor restaurant was established along with an exquisite butterfly house with free-flying butterflies of many species flitting amongst flowers and greenery. The glass greenhouses sit overlooking the English gardens of the Hofburg. Now it’s time to venture a bit farther outside the Ring to visit the Upper and Lower Belvedere Palaces, and the gardens lying in between. Eugene of Savoy was a French prince who served the Habsburgs and defeated both the French and the Turks in the 17th century. Initially, he had offered his services to his own king, but was turned down because he was too short. But in spite of his diminutive size, Prince Eugene saved the day for the Habsburgs several times and was richly rewarded. He used his proceeds well, building these fabulous palaces and collecting art and furnishings to fill them. Today, both palaces house splendid collections of art, including the works of Vienna’s most famous painters Gustav Klimt, Egon Schiele, and Oskar Kokoschka. This particular collection is in the upper palace and should be on your must-see list. But your sightseeing duties aren’t over yet. The very Baroque Schönbrunn Palace was the summer residence of the Habsburgs. Although Baroque on the outside, inside Rococo rules. Maria Theresia, who ruled for 40 years in the 18th century, provided the funds for the Rococo finishing touches. Schönbrunn is a grand palace designed with visions of Versailles in mind. Wolfgang Amadeus Mozart entertained Maria Theresia and her family and guests here at the age of six. Legend has it that Mozart declared his love for Princess Marie Antoinette, Maria Theresia’s daughter, who was 10 at the time. Like the Belvedere, the Schönbrunn palace is a must-see site. Forty-five of the 1,141 rooms in the palace are open to the public. The court architect and designer, Johann Fischer von Erlach, included 139 kitchens in his plans, but not even the emperor had a private bathroom. But don’t limit yourself to just a walk around the inside of the palace, the extensive gardens outside are exceptionally fine. They were laid out in the formal 18th century French manner. High on the hill in front of you as you leave the palace stands the delightful Gloriette. Originally, the palace itself was to sit there, but, unfortunately, the high costs involved caused a change of plans. In the gardens to your right, a fanciful palm house provides a rare look at one of the wonderful iron constructions of the late 19th century. A few meters further along the main path is the world’s oldest zoo. Maria Theresia’s husband, Franz Stephan von Lothringen, established it to house his menagerie in 1752. But prior to Franz Stephan’s zoo, Maximilian II brought an elephant to Vienna in 1552. Franz Stephan added a camel and a rhinoceros. When Napoleon was living here, he accepted two Lapland ponies, a giant kangaroo, and two beavers. A giraffe arrived in 1828 wearing leather shoes to protect its hooves on its long trek. Franz Joseph, who numbered 50,520 recorded kills during his hunting life, opened the zoo to the public in the late 19th century. The mighty Alps that stretch across Europe from France through Italy, Switzerland, and Austria end in the foothills making up the Vienna Woods, part of which lie within Vienna’s city limits. The visitor should take at least a half day to wander its paths and stop for a glass of wine and lunch at one of the small inns dotting the hills as the Viennese themselves do. After all, some of the world’s greatest musicians walked these paths. Haydn, Schubert, Mozart, Beethoven, Brahms, and the Strauss’s regularly took advantage of these walks to clear their minds and create some of the finest music ever written. Johann Strauss the Younger immortalized the natural beauty of these forests with his “Tales of the Vienna Woods”. Beneath the visible splendor of Vienna’s art, music, and architecture, lies an even richer life that is seldom noticed by its many visitors: The quality of day-to-day life for the majority of Vienna’s citizens. For example, Vienna’s streets are clean and safe. Crime is not a usual occurrence here. There is little poverty and even less downright misery in the streets. Government financed public housing has been a resounding success since its beginnings early in this century. Even the oldest complexes still provide clean, comfortable, desirable housing today. Karl-Marx-Hof is a wonderful example from the 1920s. It is a kilometer long and continues to house 1,600 families, just as it did when it opened. Hundertwasser, the Viennese artist, designed a colorful ecological fantasy in 1985 that, in addition to providing homes for 50 families, attracts many thousands of tourists every year. Universal health care is enjoyed by all of its citizens as well as sensible pensions. Vienna’s drinking water, piped directly from the eastern Alps, is as pure today as it was when it was first introduced in 1876. The Austrian tax euro also supports three opera companies, several symphony and chamber orchestras, numerous theaters, a wide range of museums, public gardens and parks, a very fine public transportation system–well, the lists go on and on. Although the Viennese pay high taxes, there is little grumbling. In fact, when surveyed several years ago the majority indicated they would be willing to pay even higher taxes rather than reduce the quality of life for the population overall. This general attitude is probably due to the fact that the Viennese can see their taxes at work in their daily lives. Vienna is a very rich city in the quality of life it provides its 1,700,000 citizens. The Viennese have learned that the good life can indeed be enjoyed by all. Vienna is, in many ways, a modern day Shangri-la. Billie Ann Lopez was an American freelance writer, born and raised in Kansas. For many years she called Vienna, the city she loved, home. Billie Ann’s articles tell you about the legends, places in Austria not often on the tourist maps and subjects close to her heart. Informative, descriptive and interesting she acquainted you with her Austria.